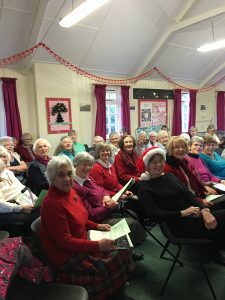 Kate Dilks, our President, welcomed 54 members and visitors, including visitors from Smeeth and Mersham WIs, to a brightly decorated Lads’ Club for the December meeting. The coffee hostesses were thanked as was Diane Hughes for her Christmas arrangement on the President’s table. The minutes (available for members to read) were taken as read. Members were reminded that the resolutions for the 2018 AGM are in the current issue of WI Life and that their completed voting forms should be returned to our Secretary Daphne at the January meeting. The annual WI subscription for 2018 is £41.00 and is also due in January. On January 26th, 2018 we will be holding our ever popular Winter Warmer Lunch. Please click on our events to read details. Coffee time or on this occasion was mulled wine and mince pies time and provided the usual chance to chat. 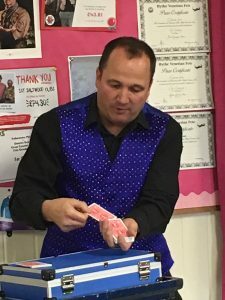 We then settled down to be entertained by magician Archie Archibald. His wit, humour and sleight of hand left members agog and quite hysterical when he tore up their £5 notes! Many of the ladies yearned to be the “Lovely Debbie Magee” with one member even attempting the splits. Disappearing olives, juicy lemons and juggling balls all contributed to a show of pure magic. 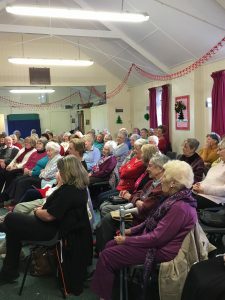 Apparently, Archie usually performs his tricks to awestruck children but he successfully rose to the challenge of the ladies of the Castle Green WI! The vote of thanks was given by Kay Hygate who also won the competition for the best Christmas tree topper.